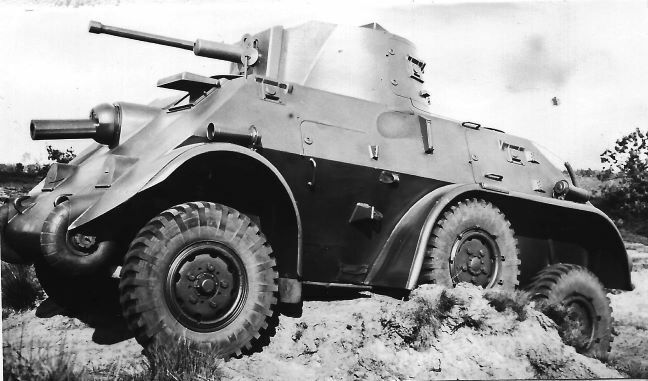 The pilot model of the M39, the “Pantrado 3” (PT-3) was standardized after trials as the Pantserwagen M39 (Armored Car, Model 1939). Twelve vehicles were ordered by the Dutch military, but only seven (7) cars were completed by the time the Netherlands were invaded in May 1940. However, the vehicles were not even fully integrated into combat units by that time and only fought on a limited scale. There are also conflicting reports that two (2) of the incomplete vehicles were pressed into service by the Germans during the invasion. Regardless, after the Dutch occupation the Germans did utilize the vehicles (some of them upgraded) as the Panzerspähwagen DAF 201 (h), until gradually losing them all on the Eastern Front. Pantserwagen DAF M39 Model Kit (35064) MR Models 1/35 Multi-Media. Reworked release. Pantserwagen DAF M39 Model Kit (R073) Retrokit 1/72 Resin. Out of Production. DAF M39 Armored Car Model Kit (135-015) Scale-Line 1/35 Resin. Pantserwagen DAF M39 Model Kit (R073) Wespe Models 1/72 Resin. Ex-Retrokit model.